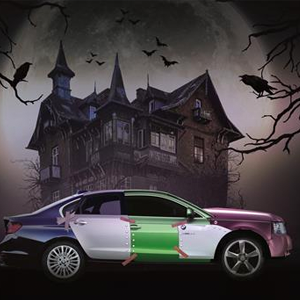 As the clocks go back and the days get darker, motorists should run a mile on sight of MotorEasy’s Hallowe’en horror show concept. The car ownership and maintenance start-up has used insights from its 40,000-strong bank of warranty plans to conjure up a vehicle that would give owners constant nightmares and sound the death knell on their bank balances with its blood-curdling £25,000 yearly repair cost. The imaginary vehicle is fashioned from the cars that generated the largest repair bills across seven component categories during the last 12 months. And the MotorEasy image of the monster proves that, were it ever to be built, the car would be as ugly as its impact on any owner’s wallet. With repair costs totalling £24,606.74, the Hallowe’en creation features the engine of a 2011 Range Rover, which alone accounts for more than half of the total bill, requiring a fix of well over £15,000. Elsewhere, the brakes of a 10-year old BMW Z4 and the electrical system of a 2009-plate Audi A3 also feature, combining to drain another £4,467 from the coffers. Duncan McClure Fisher, MotorEasy founder, said: “This car is every motorists’ nightmare, guaranteeing the maximum repair bill for a single year. “While the concept is just a bit of fun, it does nonetheless highlight the financial hit when things do go wrong with cars. MotorEasy offers a full suite of warranty services and has a nationwide network of 10,000 garages, to which customers can be connected via the website or by telephone. The company’s concierge-like service can arrange for any work required to be carried out at a trusted local workshop or customers can arrange for their car to be picked up from their home or workplace and returned after repairs.